Order Say What You Will here! Learn More About Cammie McGovern Here! 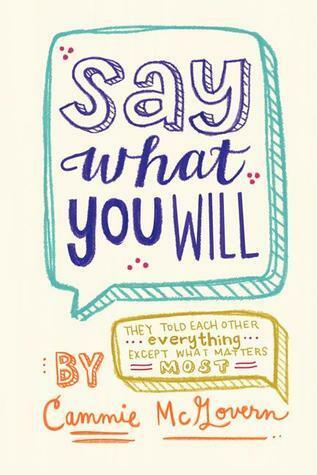 Say What You Will by Cammie McGovern is about friendship, love, and perseverance. Say What You Will is about overcoming obstacles and challenges in order to lead a normal lifestyle, in order to experience both high-school and college how many people should experience. For Amy and Matthew, their high-school experience is completely different than their peers. Amy needs the assistance of a walker to move around the school, and a voice box in order to ask questions or converse with other students. Matthew is more of a loner, and while he does not have the physical challenges that Amy has, he has to battle his own thoughts and compulsions on a daily basis. Overall, Say What You Will was enjoyable. It is a light, fluffy read that I sped through in the beginning half of the book. However, once the book reached about it's halfway point, the light reading and fluffy plot suddenly turned serious and darker. I didn't really mind the change in the plot, and I actually liked how a contemporary was able to have both lightheartedness and serious issues within it. I did, however, mind how these issues were tackled within the story. Let me clarify this again: I did not feel like these elements should not be included, but I felt like they were written in kind of "out of place", and the writing style was very rushed and strangely different than the rest of the book. I almost felt like the last half of the book would have been better if it was placed in it's own book and elaborated on. I did not really enjoy the last half of the book because it felt so rushed - I was not feeling the connection to the character's as strongly as I was in the beginning. There was a large lack of detail, especially in emotions of the characters. For example, Matthew would be scared or afraid, but the story never truly delves into how he processes these emotions and feelings like the first half of the book did. The second half of the book aside, I really did enjoy the rest of this book. I really loved how both Amy and Matthew were not the typical characters that you would read about in a Young Adult novel. Both Amy and Matthew have illnesses or disabilities (I like to use the word dif-abilities instead - different abilities - so, if you see that in my review, you know what it means). This really gives representation to a large group of people who have never really "seen themselves" in mainstream literature before. As for accuracy of the representation, I can't speak too much on it. While Amy has cerebral palsy, it is not the exact severity that I have, or with the same effects. Also, Matthew's OCD is something I have very limited knowledge about. However, I was able to skype with the author during a Battle of the Books event by me, and she revealed to us that some of these characters are loosely based on people that she knows in real life and the struggles that they had. Ms. McGovern did do research for these characters! (I would definitely write what this research is, but I do not know exactly what she went through to research these characters!). The one thing I did not like about the representation was Matthew's "type" of OCD. I know for a fact that OCD is not just making sure that everything is clean and organized, and washing your hands seven times before you eat a meal, but I feel like that is all I took out of Matthew's character. Yes, I do know that OCD can manifest in those ways, and I do know people suffer with these "rituals". I feel like this book would have connected to a lot of people, and helped readers understand what OCD really is if a large stereotype about it was not present in the book. However, I am really happy that OCD is finally being spoken about in literature - and this is a step! To clarify, I love how McGovern tackled mental illness in this story and brought it out, but it would have been even more amazing had it been tackled in a different way. This makes me very happy because often, books with different characters with different backgrounds and abilities and relationships do not normally have the research they deserve! Authors, please do research on these characters before writing your story! It would make a great difference to your readers to see an accurate representation and someone they can (kind of ) identify with versus a completely inaccurate representation. A semi-accurate representation means a lot more than no representation at all. Overall, I enjoyed this read. I really loved the beginning half of the book, and the premise of the story itself. However, I feel like the second half of the story was too rushed and deserved to be a separate book in a series so that reader's can get the detail and resolution that the characters deserve. If you want to read a fluffy romance with characters with different abilities, I would definitely try this one. The writing style was easy enough for me to understand and comprehend. However, this book does contain some serious issues (*spoiler* teen pregnancy, depression *end spoiler*) that may not suitable for younger readers. So, if you are looking to buy this book as a present or put it in your classroom library, I would recommend reading it first just to make sure that it will not be too much. I think Say What You Will is a great introduction to accurate representation of both mental and physically "different" characters. The romance and fluffy beginnings is definitely enough to hook in a reader, but the lack of emotion and detail in the ending of the story left me with a lack of understanding of the story. I would advise checking this book out at your local library to get a taste for it - I know that not all books are meant for everyone - so that way you can see if this story is for you! I am so excited to see the new books that Ms. McGovern is writing as well! Huuh this was a very good review because I feel like I got a good grasp on what worked in the book and what didn't. It's not really a book for me, and I'm glad I read your review. Thank you so much for your comment! I'm sad to hear that this book isn't for you, but thank you for consulting my review! I really, really wanted to love this book more than I did, and in some parts, I really did love it. But, some of the other parts I did not like as much. I hope you can find a book soon that is just PERFECT for you!